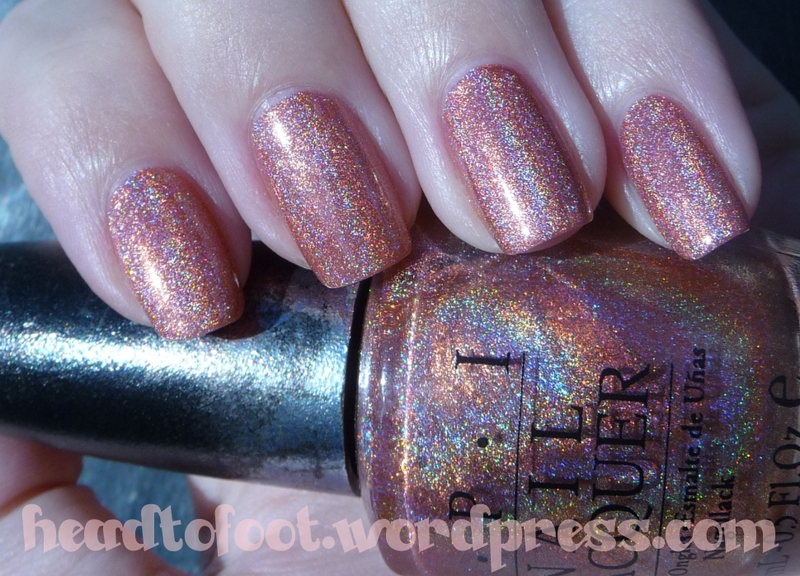 Did I ever mention that a holographic polish was actually the trigger of my nail polish addiction and my being a blogger? It all started when I saw MUS Greta in a store when I was on vacation in Finland. As some of you may know, this polish is one of the most holographic and sparkly rainbow ones out there – so no wonder I fell in love with it at first sight! When I was back home I started googling about these holographic nail polishes. I came across all these beautiful blogs and even more beautiful nail polishes – and that’s how it all started! The nail polish I’d like to show you in my 3rd Holothon posting is also much more linear than the previous two. OPI DS Vintage is not so easy to find these days anymore, it is from the Designer Series of OPI. Sometimes you can still find it on Ebay though. The base colour is hard to describe – it is somewhere between copper, peach, coral and pink! If I had to choose, I’d go with copper. The formula on this one is pretty thin (most OPI DS polishes are), but 2 coats was still enough to achieve full coverage. Application and drying time was great. I didn’t use an Aqua Base Coat and it didn’t feel like I needed one, since there was no dragging at all. Drying time was also superquick, but normal for a linear holographic nail polish. Enjoy the pictures! They get big when you click them!